Tumblr Finally Rolls Out Comments. Sort Of. Trolls Not Welcome. Just about a week ago, we noted how the blogging service Tumblr was testing out a new feature: photo replies. Apparently, the test worked so well that they decided to make it a permanent feature. They also apparently learned something else: people like commenting on posts. As such, they’ve started beta testing a new text replies feature today. Or, as the rest of us know them: comments. Now, to be clear, Tumblr notes that this features is still “very beta.” And it also only works in the Tumblr Dashboard right now (as opposed to on actual Tumblr blogs — which apparently is coming). It also only works on your main Tumblr blog right now (if you have multiple ones). But, “Some big updates are on the way. :),” founder David Karp writes. To turn it on, you need to navigate to: Customize → Advanced → Enable replies, on the main Tumblr Dashboard. Something else important to note: this feature will only apparently let people you follow reply to your posts. Sadly, this means Tumblr posts won’t have the usual anonymous comment trolls we all know and love. Baby steps. 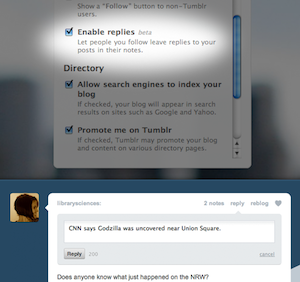 Up until now, Tumblr has not had the option to create blogs with comments enabled. Instead, they’ve suggested users try third-party services such as Disqus (which the Tumblr blog uses) to add comments to blogs. If Tumblr only plans to make this commenting feature for users you follow on the service, the third-party options may still be the best ones for most users.